It’s that time of the year again and I am busy prepping for our annual 4th of July BBQ. I wanted to make something different this year to really make it fun for the kids! I am going to setup a milk shake bar so they can cool off in the summer heat! And what better way to top off the milk shakes than with some awesome chocolate shards. 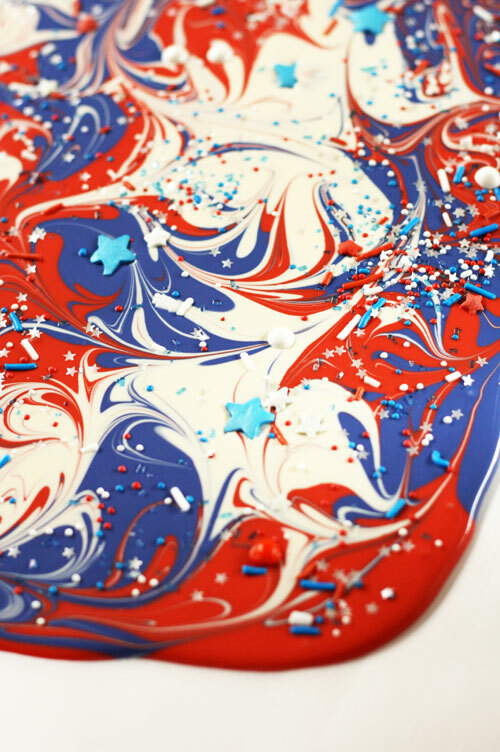 They even have stars and stripes sprinkles to make them more festive. And don’t worry the adults will be able to nibble on them with or without drinking a shake! 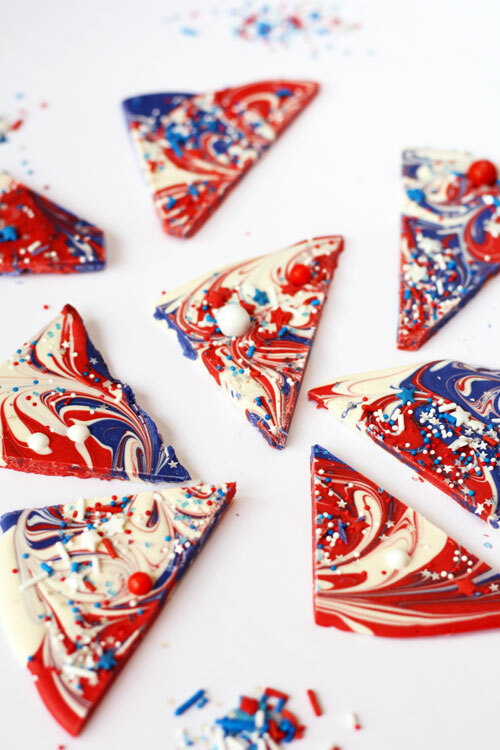 Chocolate shards are so easy to make and they can be made in many different colors. They are a great help when hosting a party because they can be made ahead of time and stored in an air tight container. 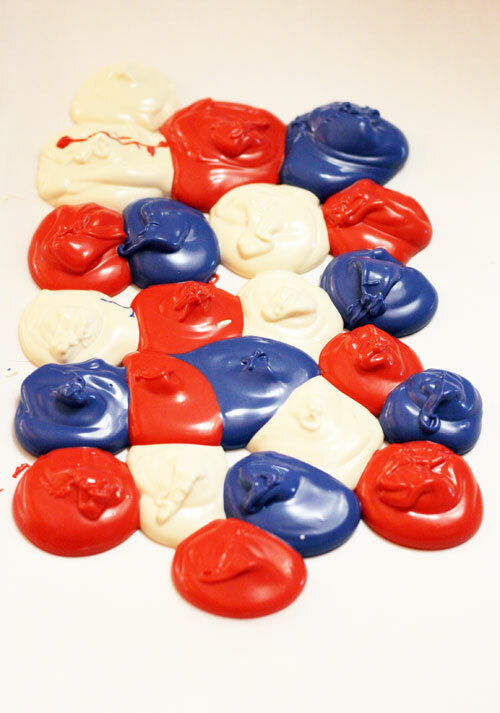 Because it’s 4th of July I chose the red, white and blue candy melts. 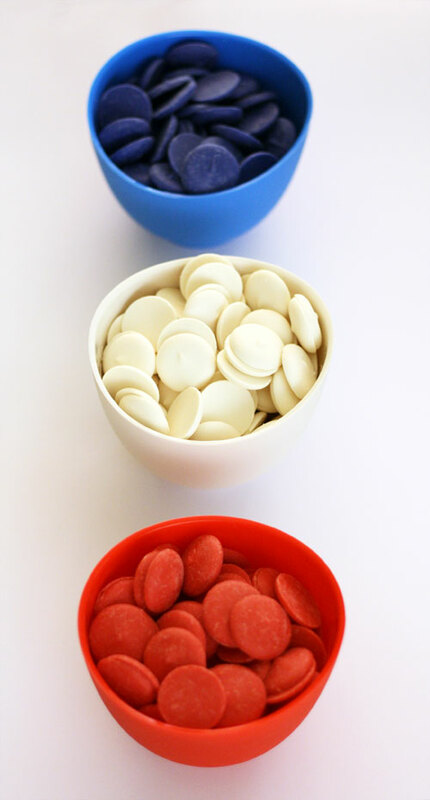 Place the candy melts in separate bowls and microwave the chocolate for 30 seconds. Take the bowl out of the microwave and stir the chocolate very well. If all of the chocolate has not melted place the bowl back in the microwave for another 15 seconds. Continue to do this until all of the chocolate has melted. 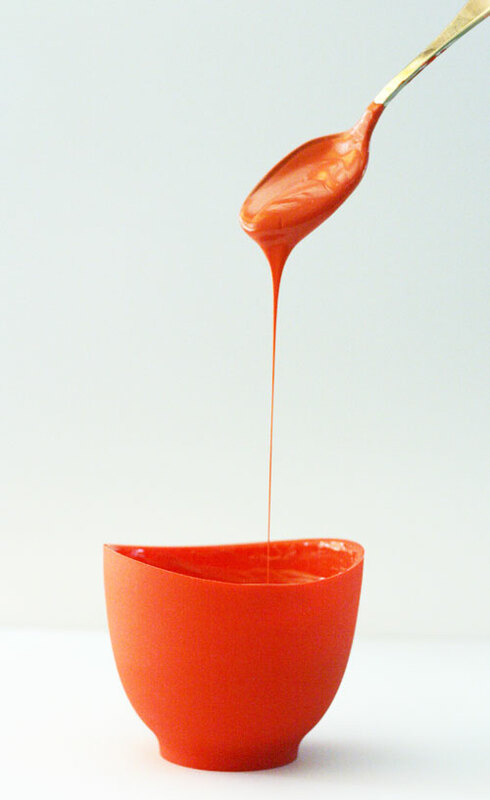 Make sure your chocolate has melted completely and that it has a nice smooth consistency. This will give you smooth and beautiful chocolate shards. 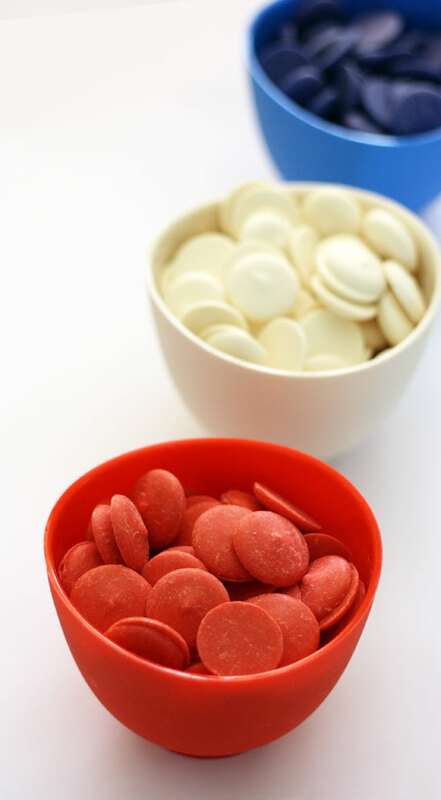 Use a spoon to drop several globs of red chocolate scattered randomly around the parchment paper. 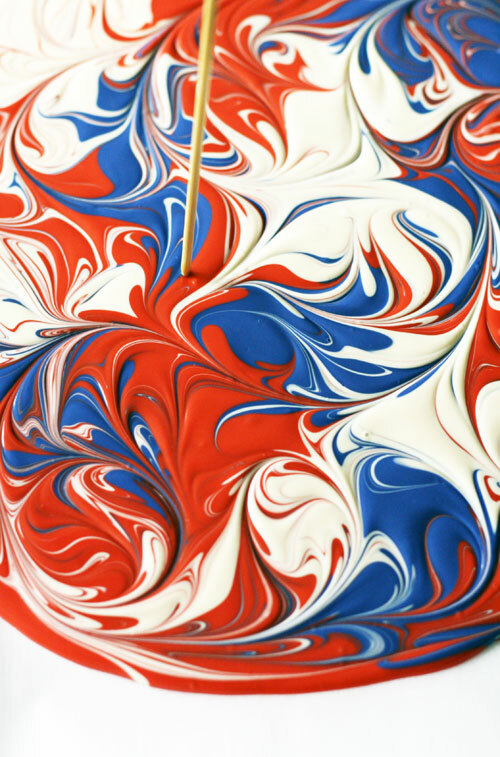 Repeat the process with the white and blue chocolate so that the area is completely filled in. 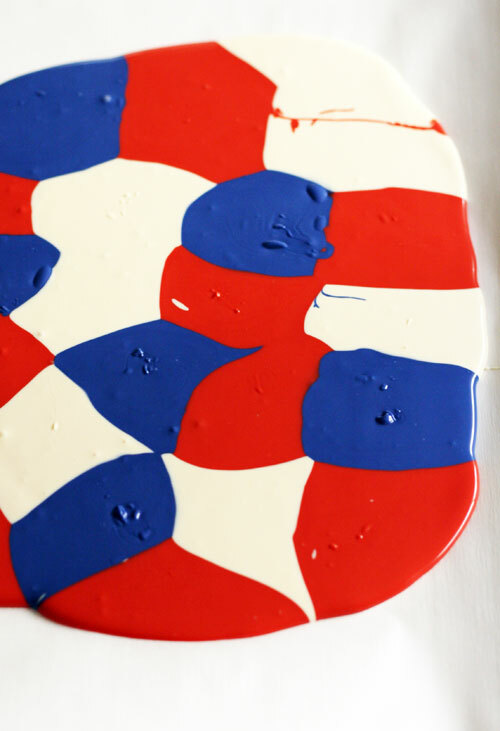 Shake your pan to create a smooth surface. Use a skewer to swirl the chocolate together. Look at all the colors melt into each other! This is the most relaxing and mesmerizing part! 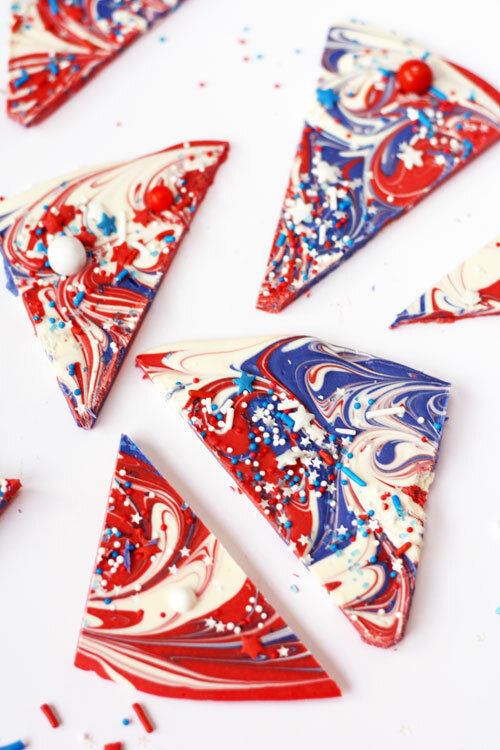 Your guests will think it took you hours to make these when in reality it only takes seconds! Sprinkle your favorite sprinkles all over the top of the chocolate. I found these great stars and strips sprinkles but you can find them to match any occasion. Once the chocolate has set, use a sharp knife to cut the chocolate into shards of various shapes and sizes. I made a quick video just to show you how easy it really is! Happy 4th of July everyone and make sure to hide a few of these for yourselves because they will disappear before you know it!